This was a retrospective review of case records with histological diagnosis of IIM in the juvenile age (<18 years) seen in the Department of Pathology, university hospital in south India between January 2010 and May 2015. This is a referral pathology department for the pathological studies of nerve and muscle diseases in this region. All the patients fulfilled the diagnostic criteria for IIM proposed by Bohan and Peter. The data collected included as follows: demographic details, clinical characteristics, electrodiagnostic data, serum creatine kinase (CK), and lactate dehydrogenase (LDH). Data regarding serum autoantibodies and magnetic resonance imaging muscle imaging were collected wherever they were done. Muscle biopsy was done by open method from the vastus lateralis muscle in all the patients. The basic panel of histochemical stains recommended by ENMC 2015 for IIMs include as follows: Hematoxylin and eosin (H and E). ATPase/Myosin fast/slow, nicotinamide adenine dinucleotide hydride tetrazolium reductase (NADH-TR), succinate dehydrogenase (SDH), cytochrome c oxidase (COX) or COX/SDH, Gomori trichrome, Periodic acid Schiff (PAS), oil red o (ORO)/Sudan B, acid phosphatase, nonspecific esterase, and Congo red. It is routine practice in our laboratory to do all the above-mentioned stains on cryostat sections except acid phosphatase and nonspecific esterase. In addition to the basic panel of histochemical stains, immunohistochemistry (IHC) with CD31 (BioGenex, California, USA; ready-to-use) was performed to assess the capillary density in the present study. Vascular domain: Thickening of vessel wall, dilated capillaries, swollen endothelial cells, and capillary dropout as on CD31. IHC for membrane attack complex (MAC), major histocompatibility complex-1 (MHC-1), characterization of inflammatory cells, myosin types, and electron microscopic studies were not done. Scoring tools were not applied and disease outcomes were not analyzed. Of the total 177 histologically confirmed patients with IIMs, JIIM accounted for 27 (15.25%). The subtype of JIIM included as follows: JDM 24 (88.89%) and juvenile overlap myositis (JOM) three (11.11%). There were 14 females and ten males and the age ranged between five and 18 (median 10.5) years. The duration of illness before biopsy varied from 15 days to 18 (median 3) months. Myalgia was present in six and contractures in one patient. Constitutional features such as fever and fatigue were present in 12 and joint pains in two patients. Cutaneous manifestations included as follows: erythematous rash (ten), typical heliotrope rash (five), Gottron's papules (five), diffuse hyperpigmentation (three) and periorbital edema, and puffiness (two). Cutaneous ulceration was seen in two patients. None of the patients showed calcinosis cutis. In addition to proximal muscle weakness (pelvic girdle > shoulder girdle), other features included nasal regurgitation in two, and dysphagia in five patients. The other features included lymphadenopathy and pericardial effusion in one patient each. Serum CK levels were >200 IU/L (295–32,169 IU/L) in 22; they were normal in two and the disease duration was 12 months and 8 months, respectively. Elevated LDH (normal 190–270) was present in 12 patients. Antinuclear antibodies (ANA) were positive in four patients. Electromyography was suggestive of primary muscle disease in the 12 patients in whom it was done [Table 1]. Muscle biopsy showed changes in all four domains, with muscle fiber and inflammatory domains being the predominantly involved domains. The muscle fiber changes were seen mostly in the perifascicular area in the form of atrophy, degeneration, regeneration, and necrosis. PFA was seen in all patients with JDM and infarction in one. PFA was highlighted on ATPase stains. PFA was prominent near avascular perimysium. Mitochondrial changes in the form of COX-negative fibers but retained SDH activity in the perifascicular area were seen in nine biopsies. There were no red ragged fibers. Sarcoplasmic vacuoles were seen in six biopsies which were negative for glycogen and neutral lipid on PAS and ORO, respectively [Figure 1]. Internal nuclei were seen in regenerating fibers. The inflammation was seen in 21 biopsies, predominantly in the perivascular and perimysial region with extension into endomysium in eight biopsies. The infiltrate was predominantly lymphocytic in 19, predominantly mononuclear in two, and absent in three. Lymphoid aggregates were seen in two biopsies; however, there was no follicle formation [Figure 2]. Perimysial fibrosis was seen in 14 biopsies and concomitant endomysial fibrosis in five. Perimysial fragmentation was not seen. Vascular abnormalities were present in all biopsies with thick vessels in ten biopsies. The capillary dropout was seen predominantly in the perifascicular area in five and neovascularization with dilated capillaries and swollen endothelial cells were seen in six biopsies [Figure 2]. The other features included type 1 predominance in five and type 2 atrophy in two biopsies [Table 2]. All patients were treated with oral corticosteroids (prednisolone 2 mg/kg/day) and methotrexate (10 mg/m2/week) subcutaneously. Steroids were tapered with improvement in clinical response. Two patients were initially given methylprednisolone (30 mg/kg/day) to induce remission. A total of 14 patients had monocyclic course with complete response and six of them were lost to follow-up after six months; seven patients had chronic relapsing disease, and three had chronic progressive disease. There were no deaths in the study period. There were three female patients, with associated systemic lupus erythematosus (SLE) in two patients and systemic sclerosis (SSc) in one patient. Both the patients with associated SLE were 10 years old, had severe limb girdle weakness. ANA and anti-dsDNA were positive in both the patients and in addition anti-Sm and antihistone antibodies were positive in one patient. Muscle biopsy in both the patients showed scattered necrotic and regenerating fibers but no PFA. There was perivascular and endomysial inflammation indicating myositis but no specific vascular changes. There was no inflammation surrounding/invading nonnecrotic muscle fibers [Figure 3]. They were treated with oral steroids and hydroxychloroquine with good response [Table 1]. The female associated with systemic sclerosis aged 14 years presented with hyperpigmentation, tight skin, and proximal, trunk-and-neck muscle weakness. Anti-PM/Scl antibodies were positive. Muscle biopsy showed scattered atrophic, necrotic, and degenerating fibers. There was no PFA. There was perivascular and sparse endomysial inflammatory infiltrate [Figure 2]. There was no inflammation surrounding/invading nonnecrotic muscle fibers. The patient was treated with oral steroids and methotrexate with good response [Table 1]. In this University hospital – based study, histologically confirmed JIIMs accounted for 15.25% of all the histologically confirmed IIMs and were 5.56-fold less common than adult IIMs, similar to the reported frequency in the other series. JDM was the most common subtype in the present study constituting 88.89% of JIIMs; this observation is in agreement with the observations in the other studies.,,, The associated autoimmune diseases with JOM include as follows: SLE, mixed connective tissue disease and less commonly other autoimmune diseases.,,, The associated auto-immune diseases in this study included SLE and systemic sclerosis. 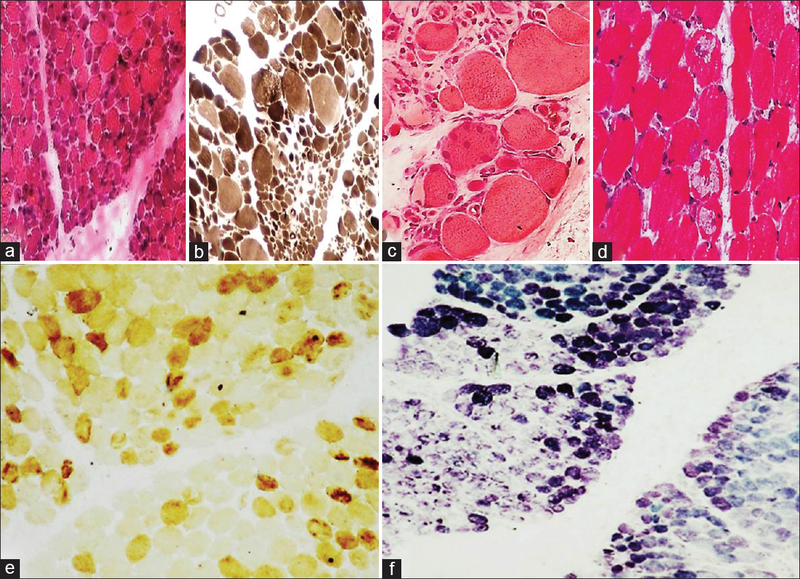 This is probably the first study on JIIM from India which characterized the histological features using the basic panel of histochemical stains in the four domains of muscle: muscle fiber, inflammatory, connective tissue, and vascular, as proposed in the ENMC international workshop 2015. In fact, the evaluation of the four domains in muscle biopsy was done first time in JDM to predict clinical course for stratification of therapeutic regime according to risk for chronic disease , and the same has been validated by Varsani et al. The pathological classification and subsequent identification of disease subtypes are extremely important for assessing treatment options and prognosis in the individual patient. In our study, muscle biopsy evaluation in the four domains using the basic panel of histochemical stains helped us to characterize the JIIM subtypes. Additional stains recommended for establishing the IIM diagnosis in doubtful cases include alkaline phosphatase, CD3, CD8, CD68, HLA-ABC/MHC 1, MAC, and p62, and CD31. We have done CD31 to evaluate capillary density to assess the severity of capillary damage. Of the 24 biopsies, capillary dropout was seen in 5 (20.83%) biopsies, predominantly in the perifascicular area. Capillary dropout, muscle infarction, regeneration with internal nuclei, and fibrosis as seen in our study were reported to correlate with the severity of disease. Pestronk suggested a myopathologic classification and described myovasculopathy predominantly in JDM. 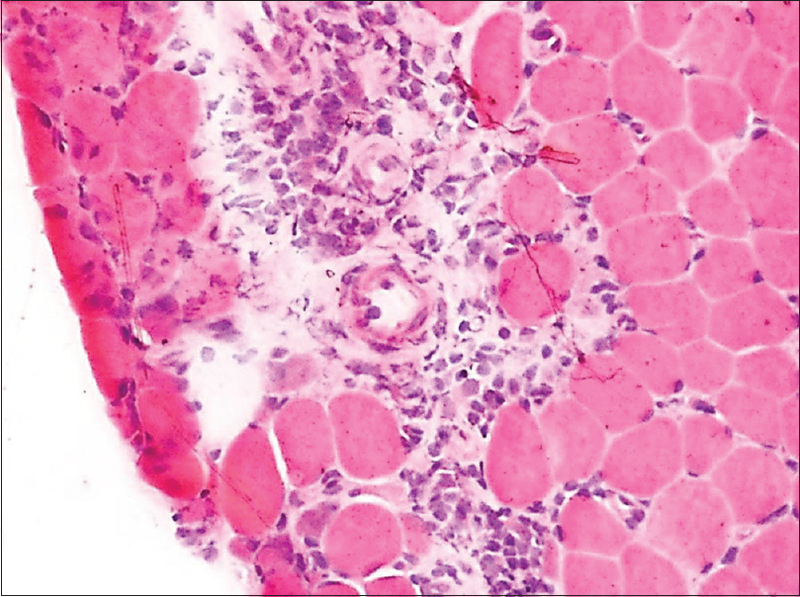 Mitochondrial abnormalities and sarcoplasmic vacuoles were also described in myovasculopathy. These features and diffuse infiltrates or lymphoid aggregates as observed in our study were reported to be associated with favorable outcome., These observations highlight the importance of detailed evaluation of muscle biopsy. JOM constitutes 6%–11% of JIIM and the second most common subtype., Overlap myositis in association with SLE and SSc are more frequent in adults than in children., The associated auto-immune disease in our patients was characterized by autoantibodies and muscle biopsy showed evidence of myositis in all the patients. Using the evaluation of four domains in muscle biopsy, we could not identify any case of pure juvenile polymyositis (JPM). Infantile polymyositis is no longer recognized as a subtype of JIIM, but was found to be congenital muscular dystrophy with laminin alpha2 deficiency., JPM is extremely rare and accounts for 4%–8% of JIIM and tends to occur in preteen or teenage years., However, the diagnosis of JPM is often a misdiagnosis and detailed study of muscle biopsy to exclude other muscle disorders with inflammatory infiltrates is essential before considering the diagnosis. The strength of the study is that this is probably the first such study in JIIM from India. This study also suggests that subtyping of JIIM is possible with evaluation in the four domains using the basic panel of histochemical stains proposed by the ENMC criteria 2015. There is a need for prospective studies with the use of additional stains and correlating the muscle biopsy findings in the four domains with the severity of the disease and treatment outcome with various treatment regimes. Muscle biopsy evaluation is important in the subtyping of JIIMs and helps in the treatment options and prognostication. Rider LG, Shah M, Mamyrova G, Huber AM, Rice MM, Targoff IN, et al. The myositis autoantibody phenotypes of the juvenile idiopathic inflammatory myopathies. Medicine (Baltimore) 2013;92:223-43. Shah M, Mamyrova G, Targoff IN, Huber AM, Malley JD, Rice MM, et al. The clinical phenotypes of the juvenile idiopathic inflammatory myopathies. Medicine (Baltimore) 2013;92:25-41. Lorenzoni PJ, Scola RH, Kay CS, Prevedello PG, Espíndola G, Werneck LC, et al. Idiopathic inflammatory myopathies in childhood: A brief review of 27 cases. Pediatr Neurol 2011;45:17-22. Yasin SA, Arnold K, Sag E, Tansley S, Moraitis E, Jacques TS, et al. Sub-phenotyping of juvenile dermatomyositis: Can it assist clinical decisions? Pediatr Rheumatol 2014;12:18. Available from: http://www.ped-rheum.com/content/12/S1/O18. [Last accessed on 2017 Mar 20]. Seth V, Kabra SK, Seurwal OP, Jain Y. Juvenile dermatomyositis. Indian J Pediatr 1996;63:375-6. Singh S, Kumar L, Shankar KR. Juvenile dermatomyositis in North India. Indian Pediatr 1997;34:193-8. Chowdhary V, Wakhlu A, Agarwal A, Misra R. Outcome in juvenile dermatomyositis. Indian Pediatr 2002;39:931-5. Mahesh A, Panchakesa RC, Rukmangatharajan S, Rajeswari S, Vasanthy N, Parthiban M. Juvenile dermatomyositis-clinical and laboratory profile. J Indian Rheumatol Assoc 2005;13:4-7. Singh S, Bansal A. Twelve years experience of juvenile dermatomyositis in North India. Rheumatol Int 2006;26:510-5. Chickermane PR, Mankad D, Khubchandani RP. Disease patterns of juvenile dermatomyositis from Western India. Indian Pediatr 2013;50:961-3. Prasad S, Misra R, Agarwal V, Lawrence A, Aggarwal A. Juvenile dermatomyositis at a tertiary care hospital: Is there any change in the last decade? Int J Rheum Dis 2013;16:556-60. Singh S, Suri D, Aulakh R, Gupta A, Rawat A, Kumar RM, et al. Mortality in children with juvenile dermatomyositis: Two decades of experience from a single tertiary care centre in North India. Clin Rheumatol 2014;33:1675-9. De Bleecker JL, De Paepe B, Aronica E, de Visser M; ENMC Myositis Muscle Biopsy Study Group, Amato A, et al. 205th ENMC international workshop: Pathology diagnosis of idiopathic inflammatory myopathies part II 28-30 March 2014, Naarden, the Netherlands. Neuromuscul Disord 2015;25:268-72. Huber AM, Mamyrova G, Lachenbruch PA, Lee JA, Katz JD, Targoff IN, et al. Early illness features associated with mortality in the juvenile idiopathic inflammatory myopathies. Arthritis Care Res (Hoboken) 2014;66:732-40. Piccolo VR, Lambot K, Breton S, Ferneiny M, Gitiaux C, Quartier P, et al. Juvenile overlap myositis: Retrospective study about 20 cases. Pediatr Rheumatol 2014;12:92. Miles L, Bove KE, Lovell D, Wargula JC, Bukulmez H, Shao M, et al. 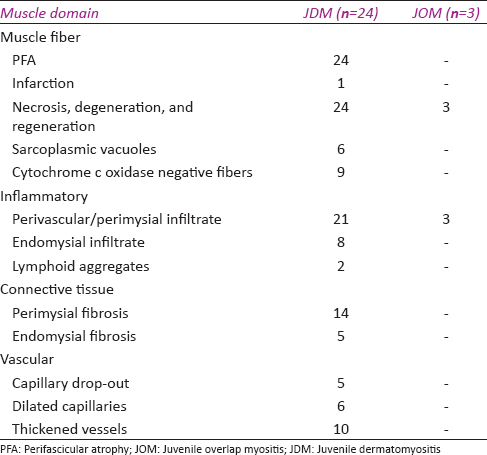 Predictability of the clinical course of juvenile dermatomyositis based on initial muscle biopsy: A retrospective study of 72 patients. Arthritis Rheum 2007;57:1183-91. Wedderburn LR, Varsani H, Li CK, Newton KR, Amato AA, Banwell B, et al. International consensus on a proposed score system for muscle biopsy evaluation in patients with juvenile dermatomyositis: A tool for potential use in clinical trials. Arthritis Rheum 2007;57:1192-201. Varsani H, Charman SC, Li CK, Marie SK, Amato AA, Banwell B, et al. Validation of a score tool for measurement of histological severity in juvenile dermatomyositis and association with clinical severity of disease. Ann Rheum Dis 2015;74:204-10. Gitiaux C, De Antonio M, Aouizerate J, Gherardi RK, Guilbert T, Barnerias C, et al. Vasculopathy-related clinical and pathological features are associated with severe juvenile dermatomyositis. Rheumatology (Oxford) 2016;55:470-9. Pestronk A. Acquired immune and inflammatory myopathies: Pathologic classification. Curr Opin Rheumatol 2011;23:595-604. López De Padilla CM, Vallejo AN, Lacomis D, McNallan K, Reed AM. Extranodal lymphoid microstructures in inflamed muscle and disease severity of new-onset juvenile dermatomyositis. Arthritis Rheum 2009;60:1160-72. Jakati S, Rajasekhar L, Uppin M, Challa S. SLE myopathy: A clinicopathological study. Int J Rheum Dis 2015;18:886-91. Fotis L, Baszis KW, White AJ, French AR. Four cases of anti-PM/Scl antibody-positive juvenile overlap syndrome with features of myositis and systemic sclerosis. J Rheumatol 2016;43:1768-9. Pegoraro E, Mancias P, Swerdlow SH, Raikow RB, Garcia C, Marks H, et al. Congenital muscular dystrophy with primary laminin alpha2 (merosin) deficiency presenting as inflammatory myopathy. Ann Neurol 1996;40:782-91. Konkay K, Kannan MA, Lingappa L, Uppin MS, Challa S. Congenital muscular dystrophy with inflammation: Diagnostic considerations. Ann Indian Acad Neurol 2016;19:356-9.